When Curiosity goes looking for organic molecules in Mars's solid surface, it vaporizes a rock sample and sniffs the gas that comes out. The plan could be going awry thanks to a pesky little mineral called jarosite. Jarosite releases an oxygen atom when it is heated up. Oxygen is very reactive, so it goes looking for other molecules to bind to. In that process, oxygen can react with organic molecules and split them before our instruments can detect their presence, and any evidence is gone a split second before we can tell if it's even there. New Scientist describes an experiment by James Lewis recently published in Astrobiology. Lewis had gotten some jarosite right here on Earth—on Brownsea Island in Dorset. Lewis removed layers of rock rich in both jarosite and organics from cliff faces on the island and brought them back to the lab to grind them into powder and heat them. He heated the powder from 400 to 1000 oC in 100 oC increments, to find out which compounds appeared at each temperature. This is similar to the technique used in Curiosity's SAM (Sample Analysis at Mars) instrument. "We never detected the organics we knew were in the sample," he says. Instead, they saw sulphur dioxide, carbon dioxide, carbon monoxide and water – what you would expect if the jarosite reacted with the organics and broke them down into other carbon compounds. That's the bad news. The good news is that jarosite isn't abundant everywhere on Mars's surface, and some forms may not release oxygen until higher temperatures than the rover uses. It could also be possible, with some additional detective work, to piece together the original molecules based on their byproducts. 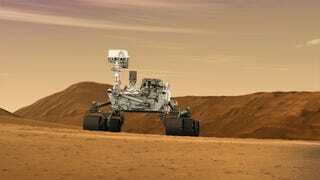 That, and Curiosity has another instrument for detecting organic molecules in the air rather than in rocks, which found methane bursts in Mars's atmosphere last year.